It’s hard to believe, but bottled water wasn’t always so popular. It was once reserved for offices with a water cooler or for carbonated waters like seltzer water or club soda. It wasn’t until the late eighties and early nineties that bottled water became a popular item due to large drink manufacturers such as Coke and Pepsi getting into the business. Once these retailers had a cost-effective way to produce bottled water and realized there was money to be made, they jumped at the opportunity. They started producing mass quantities of bottled water and heavily marketing this “healthier” option to soda. This led to a huge increase in the amount of bottled water being consumed worldwide. Since then, the consumption of bottled water has only grown and as of 2016, annual sales of bottled water grew about 9 percent, surpassing sales of sodas. But Water is Healthy, Right? You hear it all the time… make sure to drink eight glasses of water or more for good health. Bottled water makes it very convenient to drink water anywhere to ensure that you’re getting those eight glasses. While it’s true that water is necessary to remain healthy and of course it’s healthier than sugary sodas and juices, not all water is created equal. In fact, recent news has reported on a well-known bottled water company for essentially using tap water or, even worse, brands that are providing water that can be bad for your health. Courtesy: DailyMail "The pH level can range from zero to 14. 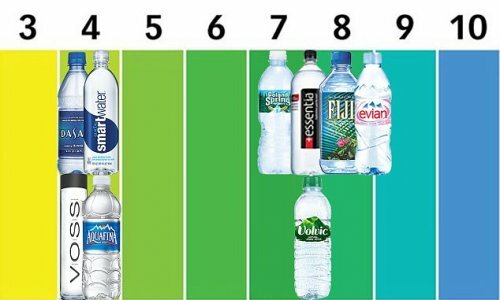 On that scale, seven is neutral, anything under that is acidic and anything higher is alkaline... Our investigation found that samples of four of nine popular bottled water brands were very acidic. The brands - Smartwater, Dasani, Aquafina and Voss - had a pH level of 4"
In recent testing done on some of the major bottled water brands, the findings of a few of those brands were not so favorable – especially with regards to oral health. Some were found to have high levels of acidity and some lacked fluoride which is essential for strong, healthy teeth. Unfortunately, both these findings in bottled water can cause damage to your teeth. Acidity in water (or other beverages) can work to erode the enamel on your teeth. Enamel is what protects your teeth from daily use when chewing, grinding, and helps to prevent sensitivity. Erosion of enamel can lead to tooth damage, pain, and a yellow appearance. Once gone, enamel cannot be restored, though there are ways that your dentist can treat the area. Therefore it’s best to minimize consumption of acidic drinks. Though fluoride in large doses is not good for you, it’s necessary to maintain good oral health. Fluoride is especially important for young people as their teeth are still developing. In fact, the government regulates the amount of fluoride in tap water to ensure we’re getting the right amount. If drinking bottled water, you may be missing out on this necessary fluoride. If it’s determined that a patient needs more fluoride, a dentist may recommend the drinking of tap water, regular use of fluoride toothpaste and mouthwash, or a fluoride treatment at the office. Unfortunately, this study and other probes into the quality of bottled water only raise more questions about whether they should be consumed regularly. While a serving of bottled water every once in a while likely won’t hurt, those who consume high amounts of bottled water can be putting their health at risk. There are other options to bottled water including the use of a reusable water bottle filled with tap water or the use of a Brita water filter pitcher if you’re concerned about the quality or taste of tap water. Using these other options will not only help save your teeth, but also your wallet.